You want to get a more tangible picture of our company? 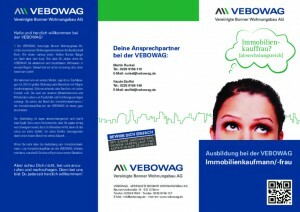 In our corporate brochure, you will find – besides our company history – more details and information on VEBOWAG projects. VEBOWAG as an employer? Our vocational education flyer outlines the occupational profile of real estate agent (m/f) and assists parents and students to make the right choice in one of the most important decisions of their life. 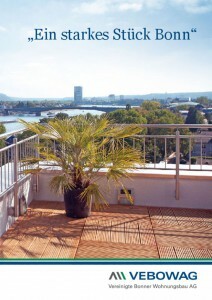 Or cast a glance at our tenant’s magazine “WohnRaum“. Here, we report about current initiatives, events, and news from the neighbourhood and we show how we create an attractive residential environment jointly with our tenants.